I prepped the figures in the usual way; soaking them in a dish of water with a couple drops of dish- soap added, then giving them a light scrub with a soft toothbrush, and then rinsing and drying them. I couldn't get the mace on the Leader figure to stand straight after repeated boiling water treatments, so I finally decided to splice out the shaft and replace it with a short piece of paper clip wire. I drilled out the Leader's hand and the mace head and used Gorilla Superglue to attach the wire. I then glued both figures to 7/8" fender washers with Aleene's Tacky glue. I then glued the washers to a tongue depressor with a couple drops of the Elmer's glue each. I began by painting both figures entirely Black. 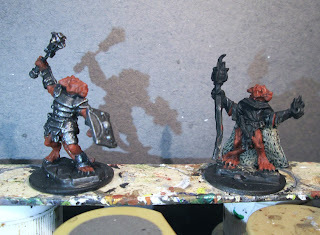 I hen drybrushed the leader's armor and mace with Folk Art Metallic's "Gunmetal Grey". Next, I painted their skin Folk Art "Barnyard Red". I then painted the interior of the Shaman's cape with Ceramcoat "Territorial Beige". I then painted the Leader's shield with Americana "Cadmium Red", and the Shaman's staff with Crafter's Acrylic "Cinnamon Brown". Then I did his shirt with Crafter's Acrylic "African Violet", and his gloves with Nicole's "Brown". I also used the "Brown" to paint the grip of his dagger. I then painted his loin cloth with Americana "Chocolate Brown", and his belts with Folk Art "Barn Wood". At this point I painted their claws with Americana "Buttermilk"and their horns with Americana "Khaki Tan". 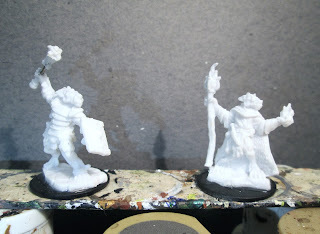 I painted the stonework bases with Folk Art "Medium Grey" and the top of the Shaman's staff with Ceramcoat "Bronze". Then, when everything had a while to dry, I gave both figures a complete wash with GW "Badab Black" wash using a wet brush. When the wash had dried, it was time to work on highlights. 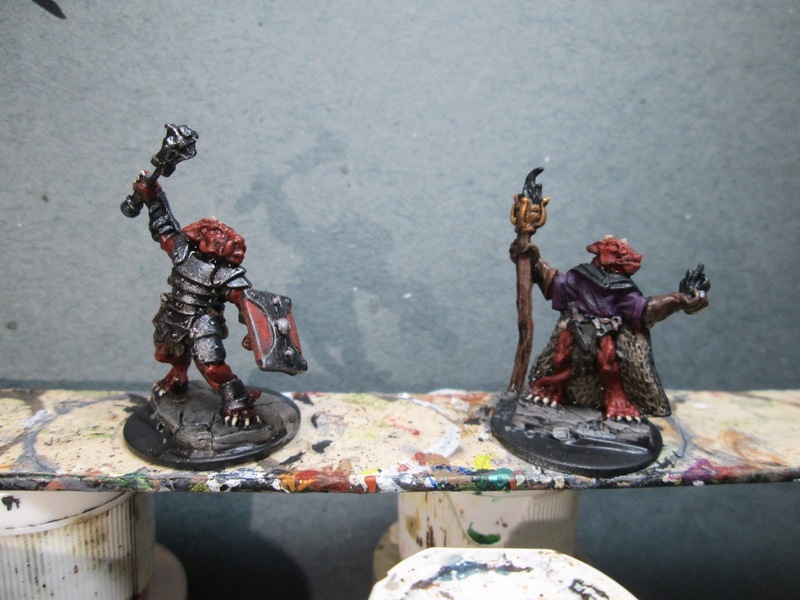 I used the "Cadmium Red" to highlight the Leader's shield and paint their eyes. 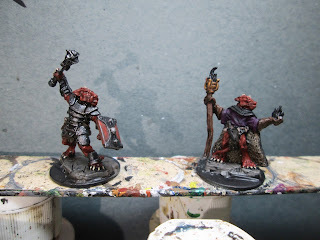 Then I used the base Barnyard Red to highlight their skin, and some Black to paint their noses. I then used Crafter's Acrylic "Storm Cloud Grey" to highlight the stonework bases, and the "Buttermilk" to paint their teeth. . After that I highlighted the Leader's armor and mace with some Folk Art Metallics "Silver Sterling". The Leader was now done, so I turned my attention to finishing the Shaman. I began by highlighting his shirt with Crafter's Acrylic "Purple Passion", and the exterior of his cape with GW "Shadow Grey". I highlighted his gloves with Americana "Sable Brown". Next, I highlighted his staff and loin cloth with Crafter's Edition"Spice Brown". Then I painted his dagger and buckle with the "Gunmetal Grey". I then worked on the flames in his hand and in the brazier on top of his staff. I decided I wanted them to be green to look more magical. I began by painting the base of the flames with Nicole's "Neon Green". 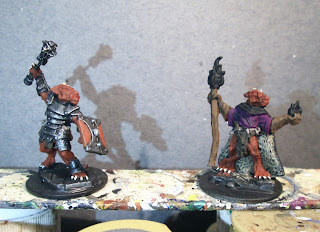 I also use this color to add some reflective glow to his left glove and the brazier. Next, I blended in Crafter's Acrylic "Holiday Green" into the flame, and then Americana 'Forest Green", then finished the tops of the flame with Accent "Forest Green". After everything had dried overnight, I gave the figures a coat of Ceramcoat "Matte Varnish" and, when dry, flocked their bases. Another overnight dry, and I sprayed them with Testor's Dullcote". 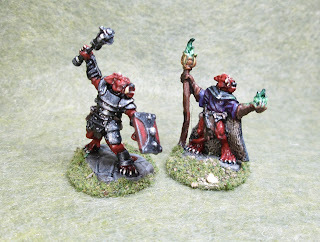 I'm happy with these two, and am particularly pleased with how the green flame turned out. I know I will be doing the green fire again, because I think it turned out pretty nifty. 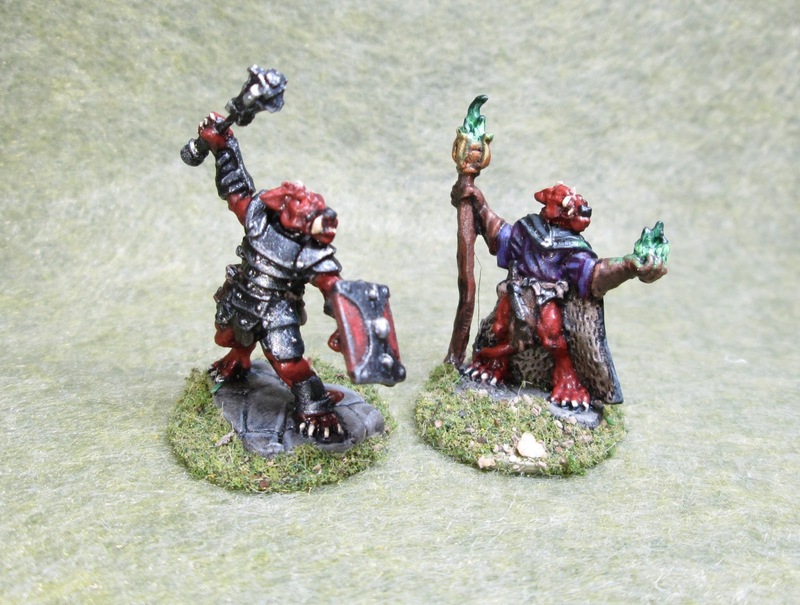 As with the Goblin Leaders I completed last week, I'm happy to finally have some command figures for my Kobold horde from the first Bones Kickstarter.